Set up in 2007 and 100% owned by Europlasma Group, CHO Power is a French company specialized in high efficiency power generation solutions from residual waste and biomass. The trans-border forwarding or on long distance of energies will go decreasingly and benefit production points ensuring territorial network for better energy independence. CHO Power is accompanying this movement. Our vision of is human sized power plants, more numerous and well accepted by populations, which will be integral part of the communities facilities along with a stadium or a library. 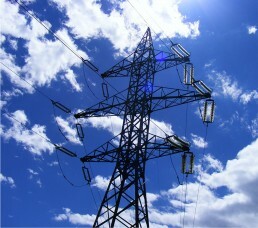 CHO POWER SITS AT THE CONFLUENCE OF ENVIRONMENT AND ENERGY MARKETS. Based on Europlasma’s recognized know-how, CHO Power has developed an electricity from waste and biomass process based on the well-established gasification+ The gasification technology is a proven technology since it already existed in the twentieth century to produce town gas from coal. Forgotten a time when the emergence of natural gas, it is now applied to the production of electricity from waste and biomass. Indeed, gasification is a thermal process that consists in heating elements primarily organic (waste, biomass ...) in an atmosphere in the absence of air to produce a gas composed of carbon monoxide and hydrogen, called synthesis gas or syngas. Although coal is a stable and dry fuel, waste and biomass are variable, and the gas obtained is less homogeneous. The refining system developed by CHO-Power solves this problem. The advantage of gasification is to transfer the energy potential of the solid fuel as a gas, and generate more electricity through the use of effective means of production, such as engines and gas turbine: the same quantity of fuel is used, and more electricity is produced principle. CHO Power has been ISO 9001 V2008-certified since 2015 for the development, design, construction and commissioning of waste and biomass power plants. 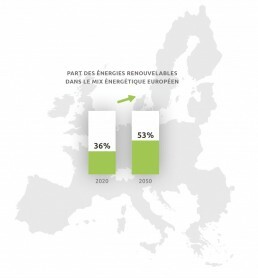 Between 2002 and 2012, the total of renewable energy produced in the EU-28 grew by 81.3% (~ +6% / an). By 2020, the share of renewable energy will increase to 36% in the European energy mix, and to 53% by 2050 (source: EU Energy, Transport and GHG Emissions Trends to 2050). Biomass, from mixed solid waste to wood pellets, is the greatest primary energy source in the mix of renewables. The growth of this market in recent years has been limited by the lack of appropriate technologies. Thanks to the use of efficient gasification technologies, the proportion of electricity produced from waste and biomass is set to grow in the years to come. In Europe, this additional renewable electricity capacity to be installed between 2015 and 2030 is estimated at 19,649 MWe; from which 6,501 MWe+ Penetration of advanced gasification has been calculated for medium sized facilities in the range 5-30 MWe capacity representing a Serviceable Available Market (SAM), on which has been applied a S-curve modeling representing the penetration rate of advanced gasification in the SAM. will be produced by advanced gasification technologies such as CHO Power.  – In reducing the share of nuclear power (75% in 2012) to 50% by 2025. 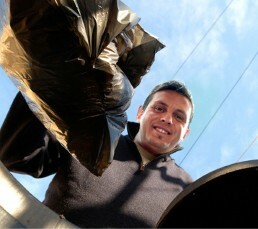 – In reducing the volume of landfilled waste to 50% by 2025.